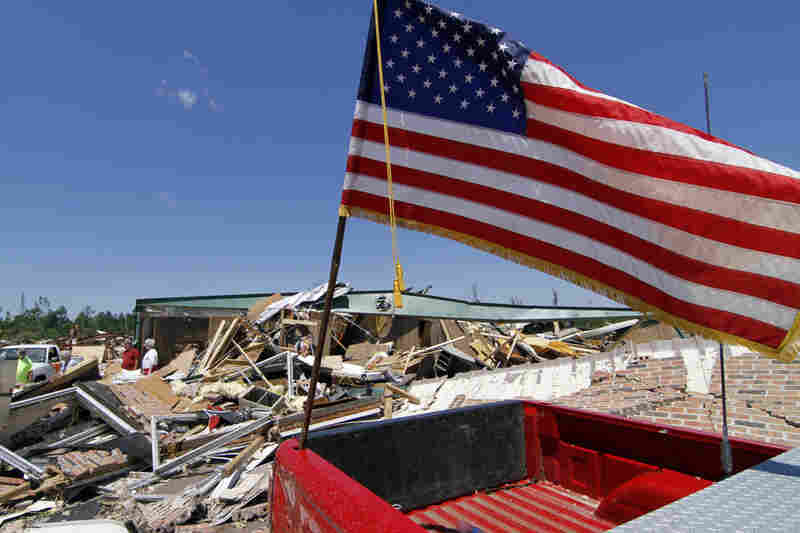 Small Towns Struggle After Storms' Destruction Three days after tornadoes hit Alabama, people are trying to cope. While the damage and destruction in Tuscaloosa and Birmingham have received plenty of attention, many of the state's smaller communities, also blitzed by tornadoes, have their own challenges. NPR's Kathy Lohr reports. 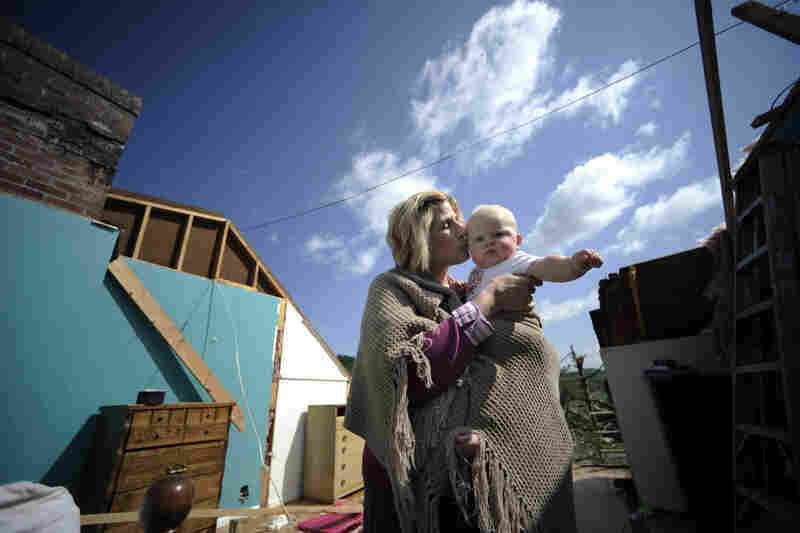 A damaged truck in a tornado-ravaged area near Rainsville, Ala.
Gail Gilland, 58, holds her 6-month-old grandson, Major Sealey, amid the wreckage of her home in Bethel, Va., Friday. Gilland survived a tornado early Thursday morning by hiding under her bed and riding out the storm while her husband, James, was trapped in the hallway. 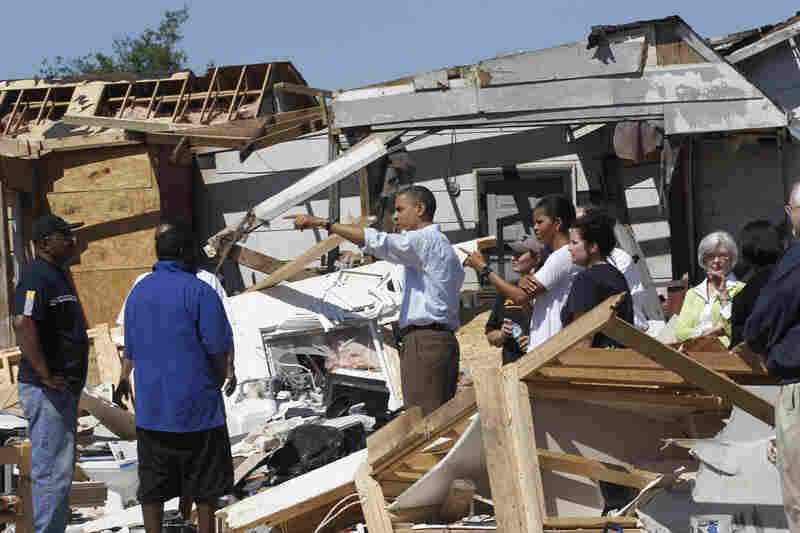 President Obama and first lady Michelle Obama tour tornado damage in Tuscaloosa, Ala., on Friday. 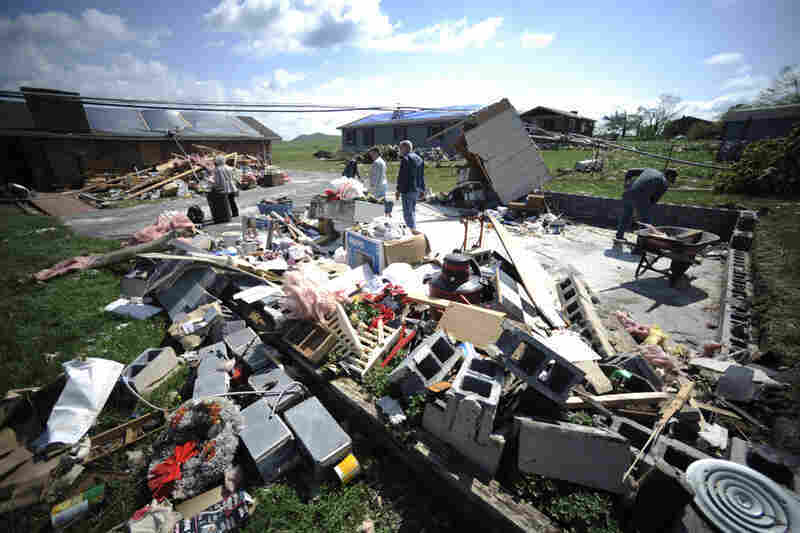 Residents clean up storm damage in Bethel, Va., on Friday. 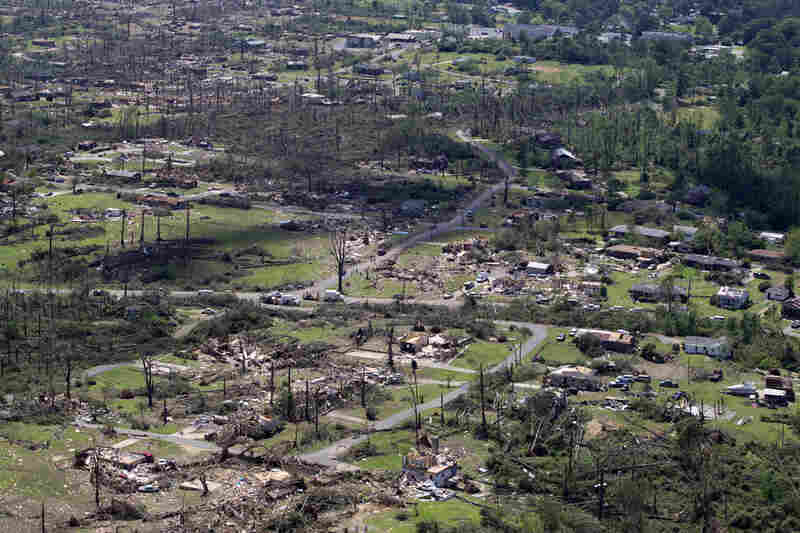 An aerial view shows the tornado damage spread over a half-mile wide path in Pleasant Grove, Ala., Thursday. 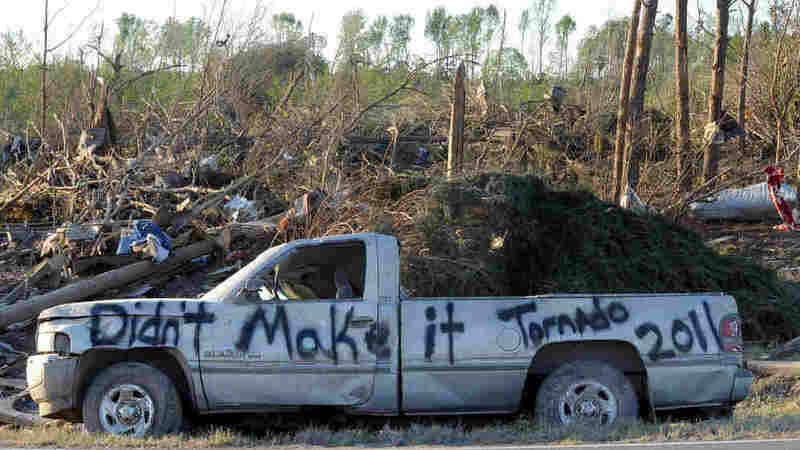 A damaged truck is covered in graffiti in a tornado-ravaged area near Rainsville, Ala., Thursday. 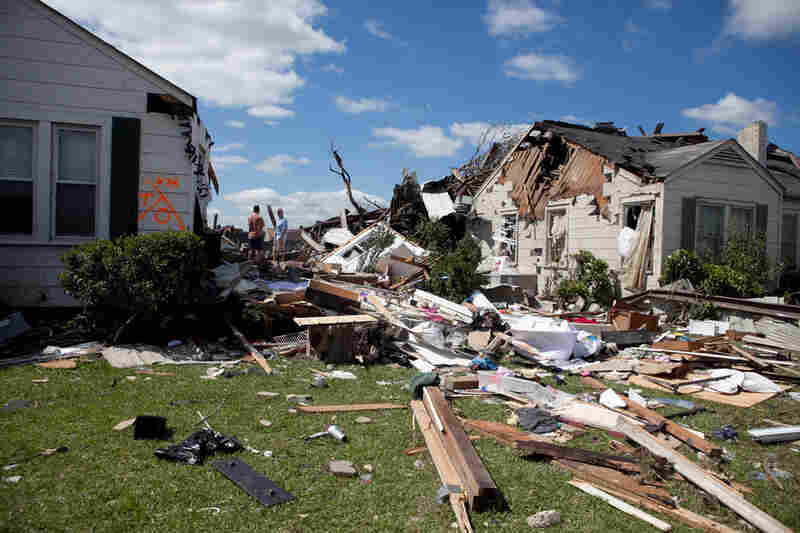 At least 32 people died in Dekalb County, when the tornado struck on Wednesday. 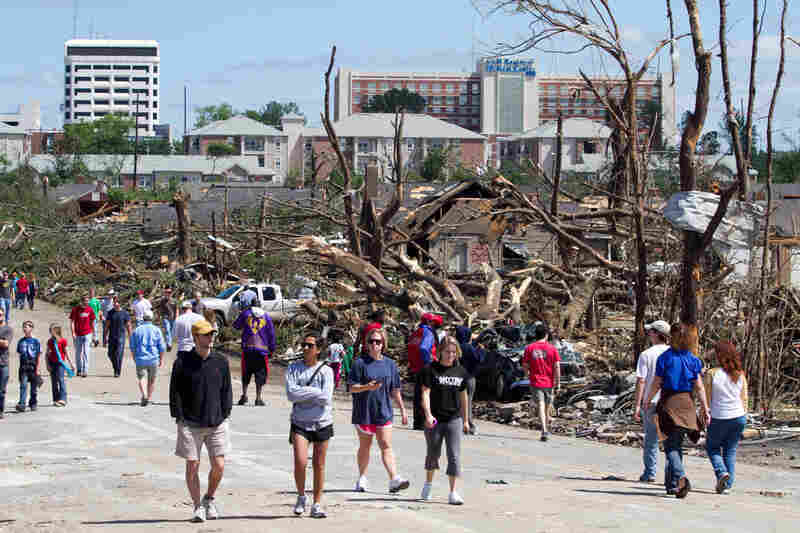 Residents wander the streets near downtown Tuscaloosa surveying the damage on Thursday. President Obama is headed to the area today. The tornado that touched down in Tuscaloosa was estimated to be one mile wide. 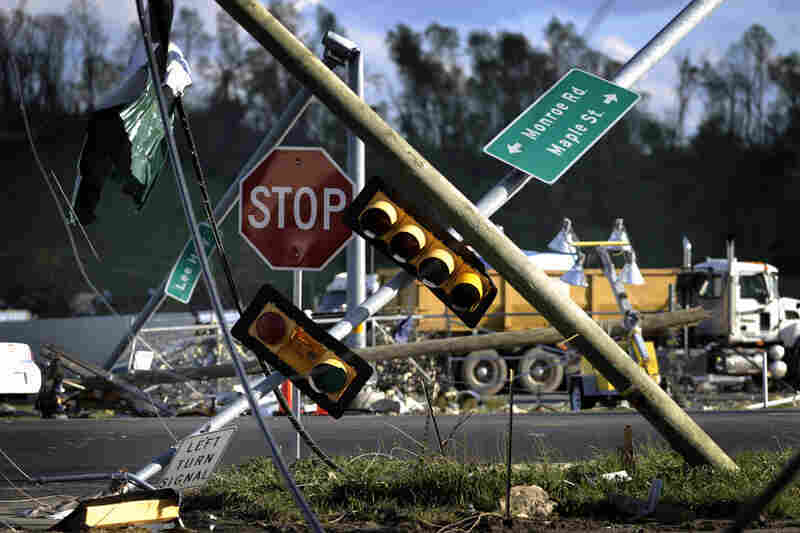 Downed traffic lights are seen near I-81 following a tornado in Glade Spring, Va. Several homes and truck-stops along I-81 were severly damaged. 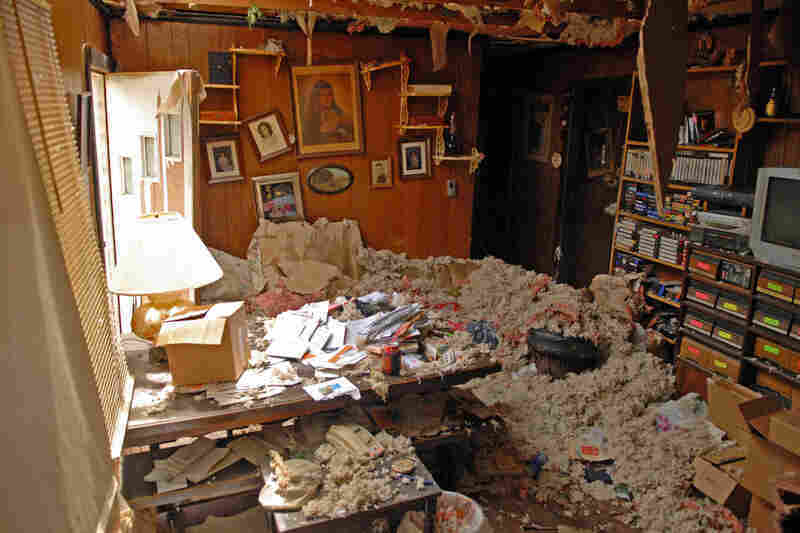 A tornado-damaged home is seen in Ringgold, Ga., on Thursday, after devastating tornadoes ripped through the area. 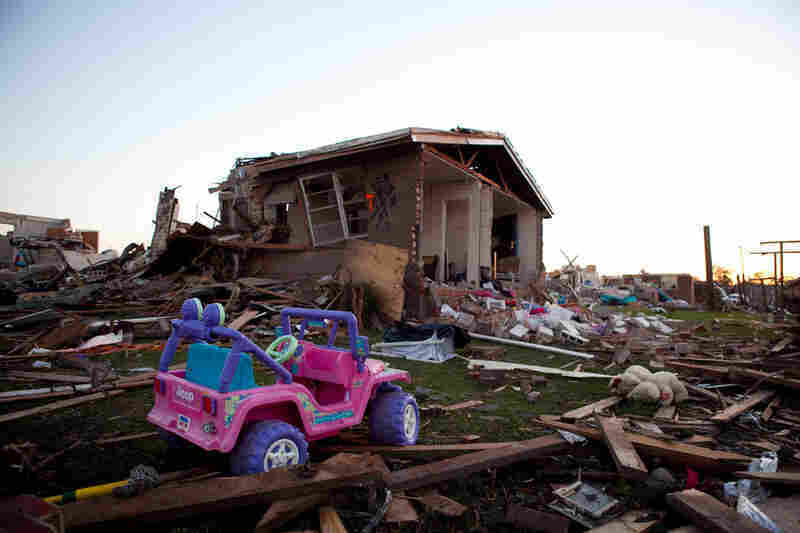 The sun sets on the devastated Rosedale community in Tuscaloosa, Ala., on Thursday. 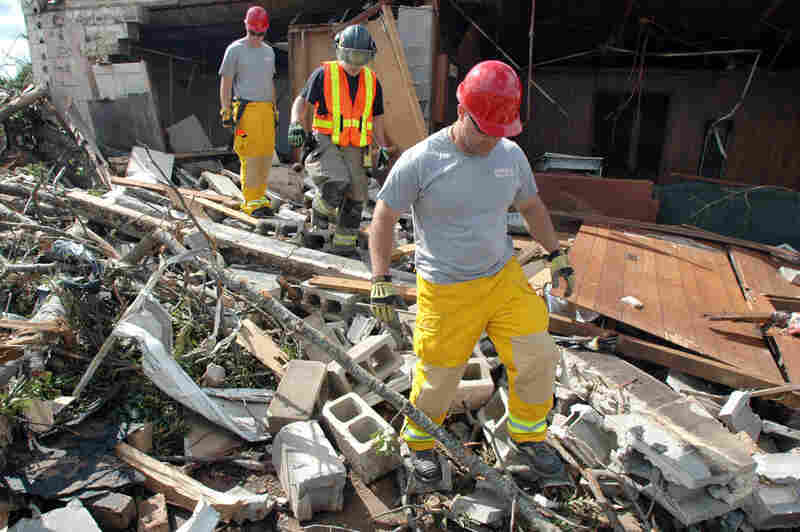 Firefighters search the rubble of a home in the Alberta City section of Tuscaloosa, Ala., on Thursday. 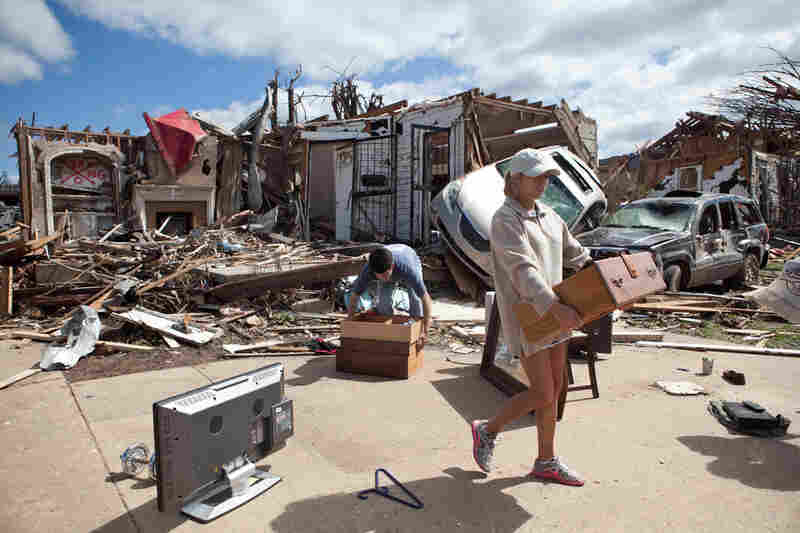 Kelly Giddens (right) helps University of Alabama law student Daniel Hinton remove belongings from his destroyed home in the Cedar Crest neighborhood of Tuscaloosa. 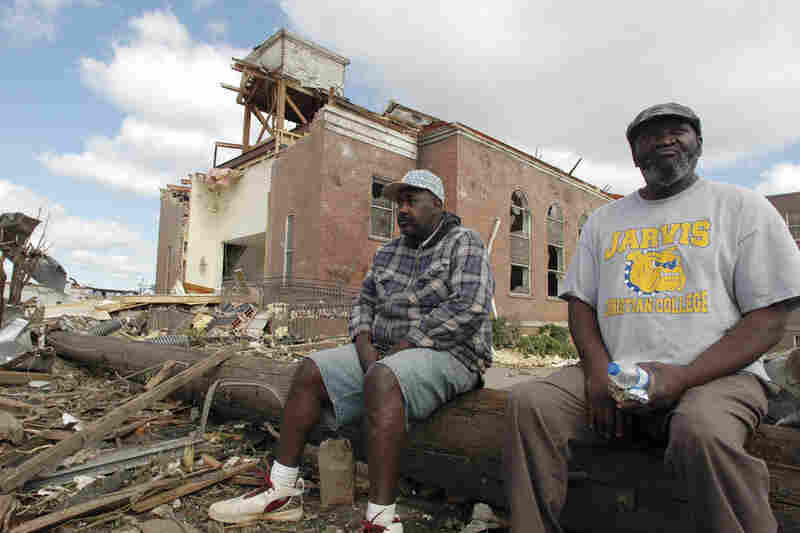 Sal Merritt and Edrich Barnes rest outside the remains of Alberta Baptist Church in Tuscaloosa. A police aerial photo shows damaged buildings in Glade Spring, Va.
An American flag flies atop a destroyed pickup truck outside the remains of the town hall in Smithville, Miss. 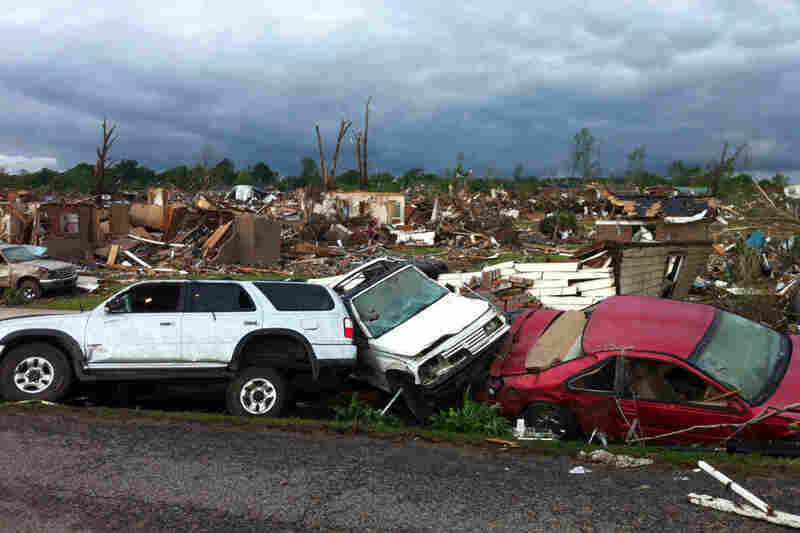 Destroyed homes in the Cedar Crest neighborhood of Tuscaloosa are surrounded by debris. 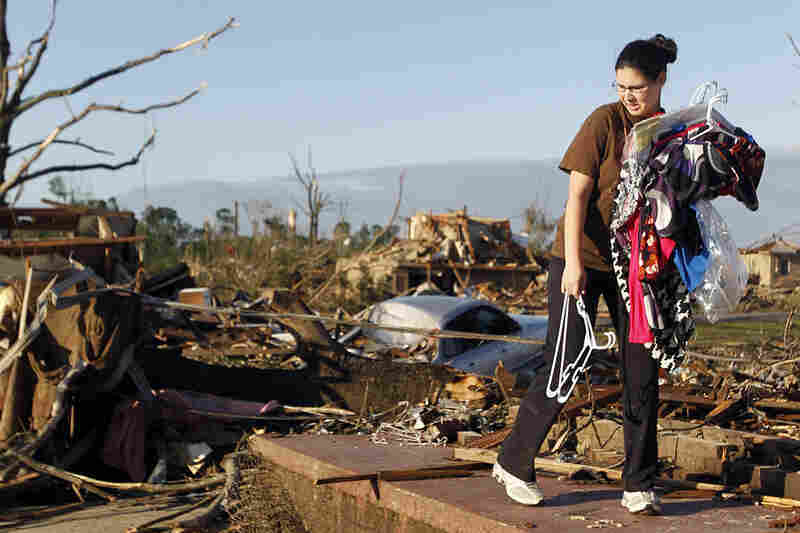 Tiffany Wood carries clothes from her home, a day after a tornado hit Pleasant Grove, Ala. Destroyed cars line the streets of Pleasant Grove. 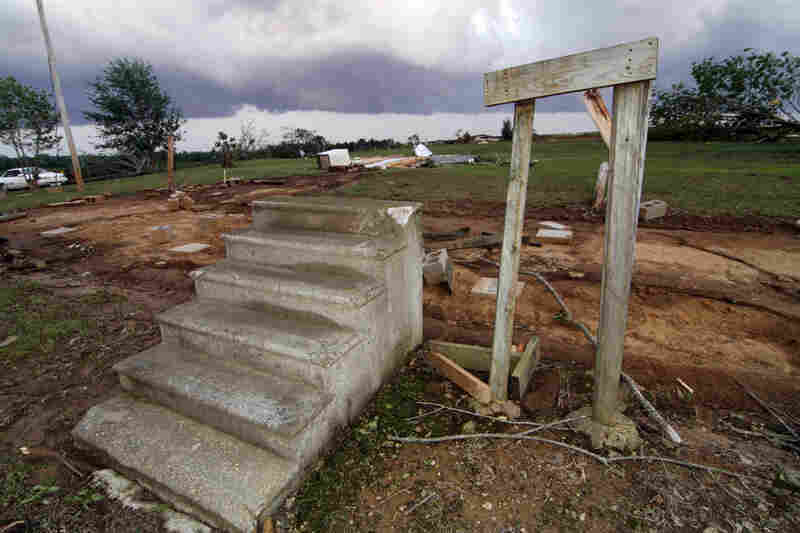 Concrete steps lead to the footprint of a mobile home that was ripped away by a tornado in Preston, Miss. 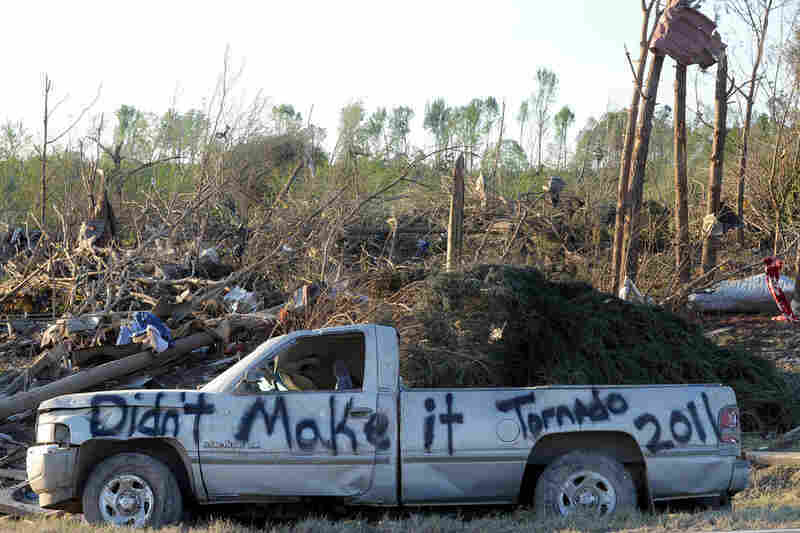 It's been three days since tornadoes ravaged the South, killing more than 300 people. In some areas not much has changed; there's no power, no water, no gas. People are struggling to get on with their day-to-day lives. In northeast Alabama, parts of Tennessee and the northwest corner of Georgia, people are sitting in long lines waiting to buy gas. Nicholas Goodridge was thrilled that this service station in Rising Fawn, Ga., just across the Alabama border, was open. "We're filling up my car and two of our gas cans, and my granddad is filling up two of his gas cans and there's a $100 limit," he says. "We don't have power and we've been running a generator for several days – actually, two days. There was still no power in this area Friday, but the station was using a generator to operate the pumps. In fact, much of the power in northeastern Alabama has not been restored, but people here are making do. In DeKalb County near Rainsville, splintered tree stumps and shattered buildings line state Highway 35. 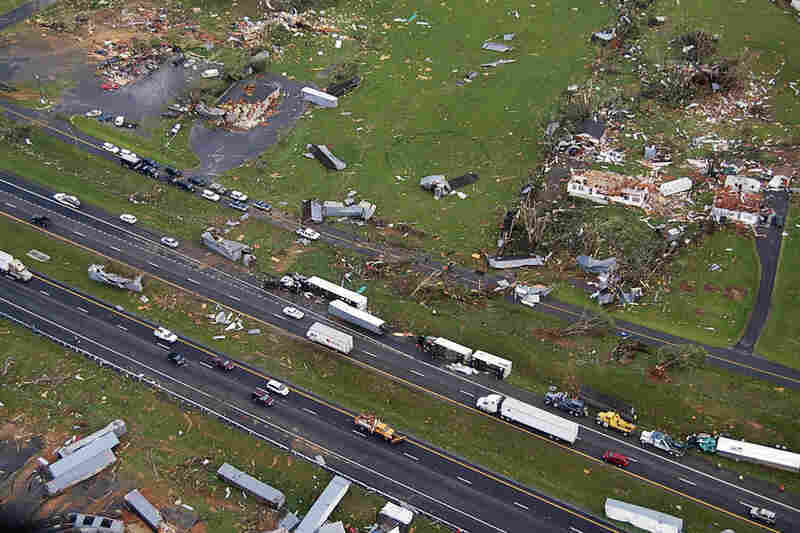 The tornado was so powerful it killed 25 people having supper in a Huddle House restaurant. There's little left of the place. Officials say it may take a few more days or up to a week restore power in some remote areas. "It bothers me at night. I wake up and I think about the loss of life, but the people in the area are good people — strong people." Yvonne Mason of Fort Payne, Ala. The Wal-Mart parking lot is one of the few places that was bustling. Tip Pack, with the Fort Payne police, is directing traffic. "Are you needing fuel?" he asked one driver. "No, I'm trying to get my medicine," the man responded. "Ok, alright. You're probably better off to go right down through there and just find you somewhere to park," Pack instructed. "They just started pumping fuel and stuff today, and every city and town around us is without power also, so it's bad everywhere," Pack said. A line of cars and trucks snaked through the parking lot, growing longer throughout the day as people found out the store and the pumps were open. Yvonne Mason, a fifth-grade teacher at Fort Payne Middle School, was trying to pick up a few groceries — something that didn't need to be refrigerated. She's still shaken because so many people, at least 32, were confirmed dead in this single rural county. "It bothers me at night," she says. I wake up and I think about the loss of life, but the people in the area are good people — strong people." "If you noticed, people are calm and they're courteous and we're helping each other and we'll get through it. It's just a matter of taking one day at a time," she says. "Deal with this day, and then tomorrow comes, and we'll deal with it." Everyone wants to see power restored. They'd like to take a hot shower and get a home-cooked meal. But so many say they can't complain; they got away with their lives.